We took off for the weekend a little early this year. It was long overdue. Usually, Mary and I head up to Maine for a long weekend in May, but this year Cape Cod was calling. The Cape is a place that both of us have experienced many times during our lives, and has so many memories for each of us. Strange thing is we have only been there, together, once in the past five years. I realized that this weekend, and I think I know why. 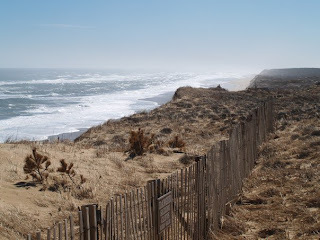 For most of my adult life the Cape has been one of those places that not only was fun to explore, but a place to go for healing and reflection as well. It is also a place to share. Well, since Mary and I have been together, there was no need for reflection, and healing, and we have found many other places to explore. I think it was the sharing part that finally came into play, and sometimes that takes longer to be able to do that. As a teenager, the Cape was a great place to build memories. Many other memories came over the years, and it was nice to share the memory of those places with Mary this weekend. It was a long time in coming. One thing that I noticed as I searched for those memory places was just how much the Cape has changed. Maybe they were little changes each year, but for someone that has not been there in a long time those little changes have a way of filling a bucket. The landscape, the coastline, buildings, and roads have all had their share of change over time. Just enough of a difference to remove the past from the present, and although it is a bit anti-nostalgic, it is a great way to have new experiences without the hindrances of the past. Today, I have many great, new memories. We gotta do this more often.